Print part of the flipping created by MAC? You would like to print part of the flipping book if needed. It is just what you think about. How to allow people print current page or part of all the pages only? After create a satisfied flipbook through FlipBook Creator for MAC, you may meet a problem that enables others to print it or not. If the content just what you planed to popularize on public, it is just not a matter of security. So to wide spread it, you should open this function of printing allows others print without limits. 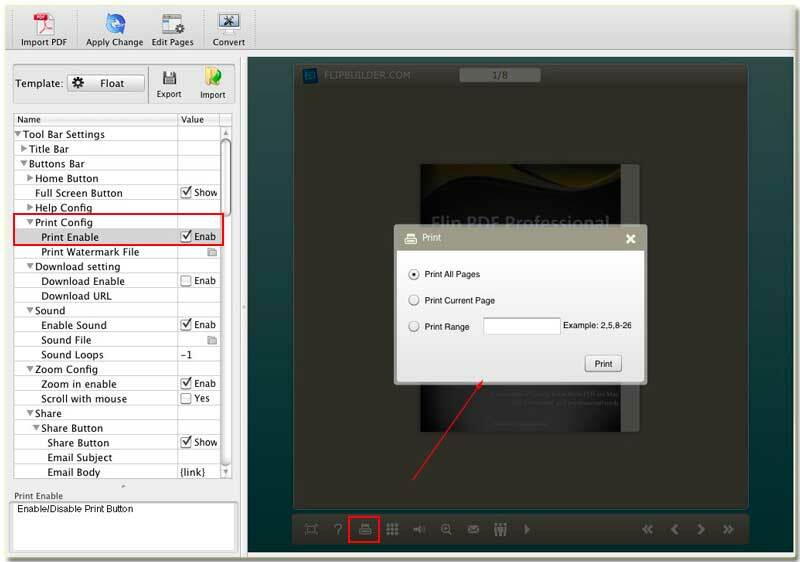 In order to make wide perspective customers, you can try to open the print function. Step1: Launch FlipBook Creator for MAC, and then import a PDF and then edit it as a flipbook. Step2: Hover your mouse to the left settings place to find the print config out. Step3: Check the checkbox which just controls the print function switch. Please refer to the below illustration which can guide you more clearly.